Summers are fun. Summers are packed. And all these sunny days makes one want to go to all the little neighborhood art and community festivals that pop up on the weekends. And some truly have more unusual draws. In Bellingham, the month of August started with some “Repurposed Fun” at a few of these festivals. Eberhard Eichner, Lead Designer/Builder of THE RE Store’s RE Vision Division, gave the strolling public two occasions to contemplate the art (and craft) of reuse. August 1st – the 4th Annual Door Art Throwdown was organized by Allied Arts in the parking lot behind the Federal Building on Cornwall St. Eberhard was one of the four teams of artists given two hours to do a door make over (all were reclaimed and donated by The RE Store). 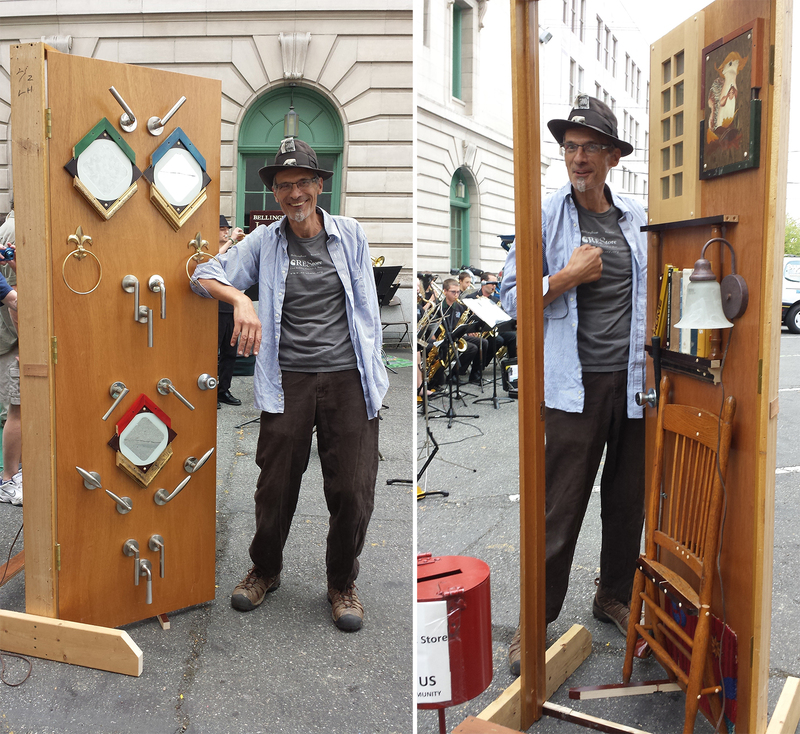 All the door artists were painters, but Eberhard decorated a reclaimed solid core door with a collage of “real” salvaged items, both sides having been given a makeover. Hung in a jamb, it retained its full functionality after the materials were added, the front side included: a “flattened” chair, a small piece of rug, a bookshelf with a rather eclectic selection of books, a former kitchen cabinet door as window, a framed picture, a wall mounted reading lamp and, last but not least, a golf club. The working title for this side was “A Room In-Between”. The back side of the door was an abstract application of door handles, mirrors and sample picture frame corners. In a Cubist, Dada-esque, and very silly fashion, it vaguely resembled a self-portrait of the artist. Title: “My Repurposed Self in a Mirror”. At the end of the event all doors were sold by silent auction as a fundraiser for Allied Arts. And then on August 2nd, the REvison Division partnered with Bellingham’s Make.Shift Gallery in giving their annual block party a repurposed “Built-In”. Eberhard took his tools and tubs of marginal, orphaned and overstocked RE Store material to the street. Similar to his regular Saturday in-store building demos, he constructed on the spot a gallery seat grouping for the Make.Shift main gallery space. Two Windsor-type chairs were “joined at the hip” by former bed frame boards, crib rails and arm rests. They were oriented in love seat fashion opposing each other. Two loose side chairs or stools of different elevations completed the arrangement. He used underpinnings of salvaged barstool legs, and for the seats, heat exchange grates. Randomly selected hinges acted as fasteners, plumbing parts as accents and two rows of the springy type of door stoppers gave it “interactive” detail. Now, the tired or contemplative gallery viewers can rest their bones, while looking at art on the walls. The gallery seat will be a permanent feature in the Make.Shift gallery. Both of these demos, and the resulting pieces, gave the public a further example of how, why, and where repurpose works. And, as the packed summer fades into fall, they will tell of the repurposed fun we’ve had and provide good summer memories to reflect upon.